Dave Brown, a second generation organbuilder, Dave spent childhood days in the factory of Brown and Arkley, Organbuilders of Sydney, visiting big projects like Brisbane City Hall (Willis) and Townsville Anglican Cathedral (B&A), and much time was spent during his teenage years helping out with new organs and rebuilding projects with his father’s present firm, Ian D. Brown and Associates. He is also trained as a master woodworker, a skill necessary to the Buzard team! He formally began his career in organbuilding with the commencement of his 4 year apprenticeship with Australian Pipe Organs of Melbourne in 2000, and gained experience in all areas of the trade, including general organbuilding, electronics, voicing and finishing, pipemaking, restoration and tuning and maintenance. During this time he also served on the committee of the Victorian Society of Organists. 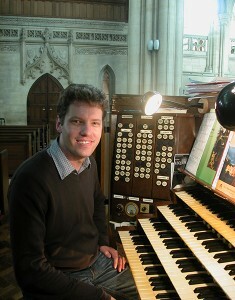 With an expanding interest in gaining organbuilding experience outside his native Australia, Dave undertook an extended tour of the cathedrals and organs of England in 2004, and soon after sought work in the USA and has been immensely enjoying working for Buzard Organ Company since 2005. We are proud to have had him on our team now for over a decade!